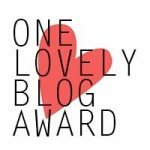 Thanks to TLE contributor Nathan for nominating us for a One Lovely Blog Award. We think you’re lovely, too! In the spirit of recognizing superawesome blogs, we’d like to nominate these folks, too: UpDown Bindery & Press, Bind & Create, Not a Sonnet, CG Says Something Loudly. Keep on blogging (and writing, and drawing, and taking pictures, and everything else), good people.